Well, I had an interesting weekend! Our realtor here in Jupiter, Florida (Jill Byers Geraci, who is awesome and has become a great friend-I highly recommend her!) took us to Uncle Eddie’s Ristorante where the 90+ year old owner’s dad grabbed my hand took me for a spin on the dance floor! It feels like I have about fifteen feet when I try to dance, so I’m sure he regretted his decision immediately, but I gave it a whirl, literally. If you’re looking for some old-school Italian fun, you should swing by Uncle Eddie’s. Place is a hoot. My only regret is that Papa (my dance partner) never got around to letting me try the coconut grappa he promised to bring out… but that might be just as well. The last time I drank grappa I woke up straddling my mother! Kilty as Sin is finally 99c! If you’ve been waiting for Kilty as Sin to go on sale, today is the day! Broch and Catriona hit Vegas for another breathtaking adventure in book four of the delightful Kilty romantic suspense series! When Broch is left for dead and Catriona taken, it’s a race against time to reunite before the Russian’s plans come to their twisted conclusion. Back in Hollywood, Catriona’s recently returned time-traveling father has his eyes on her adoptive father, Sean. When Sean discovers Rune possess powers he never imagined, it will take an old and unusual friend to set things straight. Fans of Janet Evanovich, J.D. Robb and Angie Fox will delight to find a series that provides an unique, perfect blending of thrills and humor with a splash of romance and time travel. Win 21+ Romantic Suspense eBooks + Bonus Paperbacks! 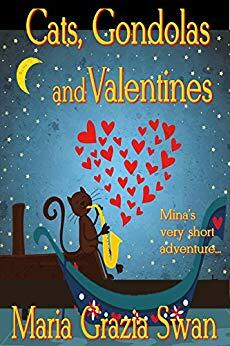 Short story/It’s Valentine’s Day and Mina is in Las Vegas for a conference about abandoned cats. And the conference is at The Venetian. Love is in the air. Unfortunately so is the love of her life, Diego, who is fly to a distant meeting. Or is he? 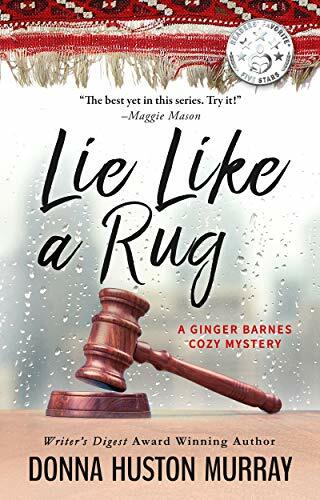 Writer’s Digest Award-Winning AuthorWhile escorting Bryn Derwyn Academy’s most infamous student downtown to be scared straight by a Federal judge, Ginger Barnes is shocked to find her childhood babysitter, textile professor Charlie Finnemeyer, on trial for fraudulently aging an Oriental rug. Even more alarming, Gin learns that two witnesses against her beloved “Uncle Wunk” suffered suspiciously convenient heart attacks.Eager to assist the professor’s attorney, the veteran amateur sleuth pries secret information from a university president and uncovers past transgressions of a TV craft show host—all while acquiring an overnight education in early American textiles from experts at Winterthur and the Philadelphia Museum of Art. Others guilty of questionable behavior: two antique dealers, and Charlie’s overprotective wife. Still, damning evidence can’t be swept under a rug. Before Gin can persuade anyone else that Charlie is innocent, she must first convince herself.